Heat toasted sesame oil and 2 teaspoons of olive oil in large skillet over medium heat. Add tempeh chunks and cook several minutes until browned on all sides. Remove from pan and sprinkle with soy sauce and chili powder. Toss to coat and set aside. Keep skillet on the stove, increase heat to medium-high and add remaining 1 tablespoon of olive oil. Add leek and cook for just one minute until softened. Add red pepper and carrots next and cook for 2 minutes. Add cauliflower and cook for another 1 minute, then broccoli and snow peas. Cook for 1 minute more, add teriyaki sauce, cover and cook until vegetables are tender-crisp, about 3 minutes. Add tempeh to vegetables and stir until heated through. Serve with rice or noodle cake. Bring a medium pan of salted water to a boil. 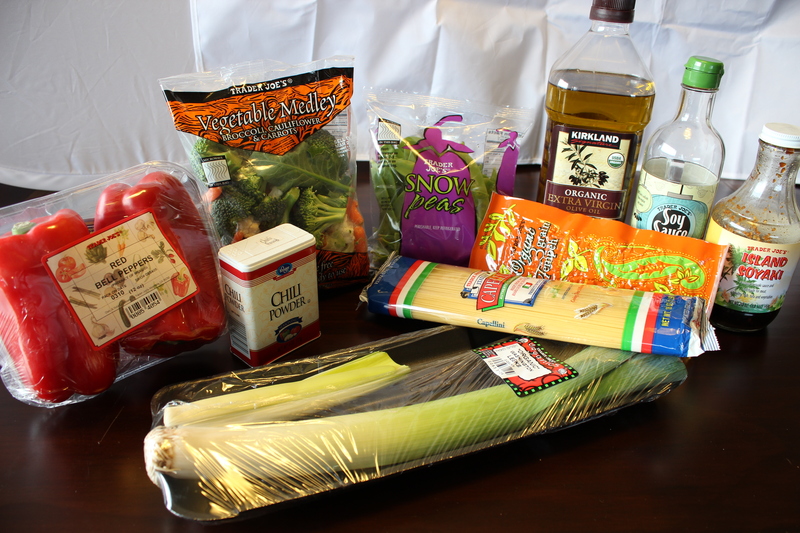 Add capellini or angel hair, cook according to package directions, and drain. Heat olive oil in a medium-to-large skillet over medium heat. Add cooked noodles and spread evenly to cover bottom of pan. Let cook 2-4 minutes or until brown and crispy. 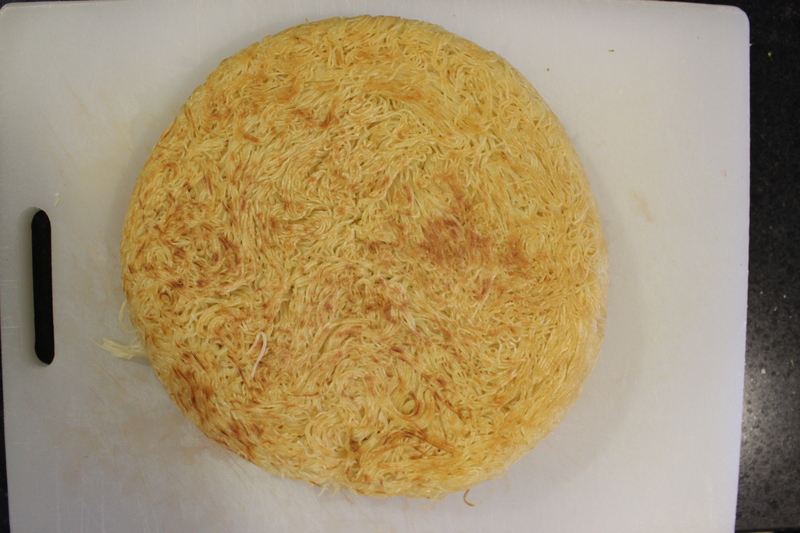 Then, invert onto a plate and slide noodle cake back into skillet to brown the other side. Cook 2-4 minutes until crispy. Remove from pan and cut into quarters. Inspired by two cooking techniques. In Nava Atlas’ cookbook, Vegetarian Express, she seasons tempeh for a fajita recipe with soy sauce and chili powder. It makes a nice combination and works surprisingly well in Asian-inspired dishes. 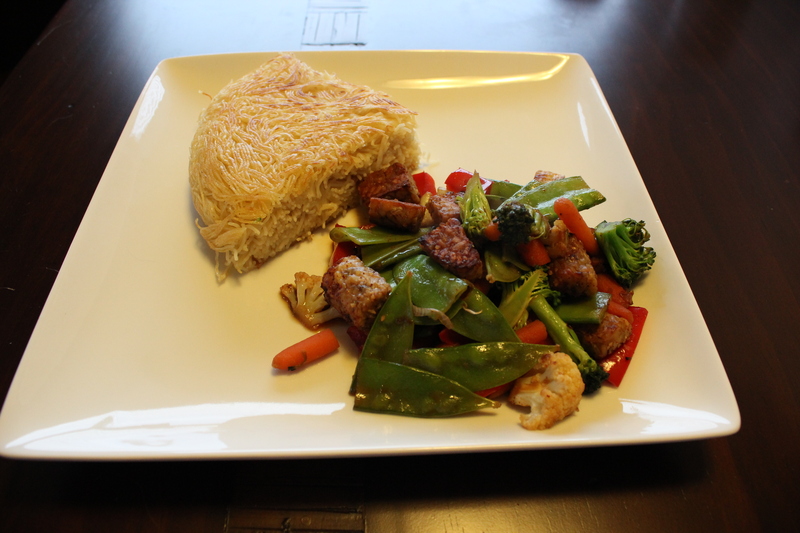 As an alternative to the usual rice side dish, I took inspiration from a noodle cake recipe from Vegetarian Times. Can I trim anywhere to save calories? I cut the noodle cake into four equal pieces which is reflected in the nutrition analysis above. However, I realized as I was eating it that it was quite a generous portion. To save calories, you could cut it into 6 pieces instead. I’d still divide the veggies into just four servings. Save the two extra “pieces” of noodle to enjoy a different way, like with marinara sauce. Also, oil was a big contributor to calories in this recipe. If you could get by with less, you’d knock the number down a bit. 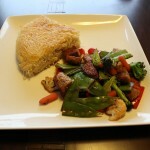 Tempeh is easy to use and tasty. Tempeh might be unfamiliar to many, but I find its firmness more appealing than tofu for folks who are just beginning to branch out with trying plant proteins. It browns nicely and smells warm and savory while it’s cooking. Do you find you have to be stealthy to get your family to eat better? Or are they pretty accepting of new foods?